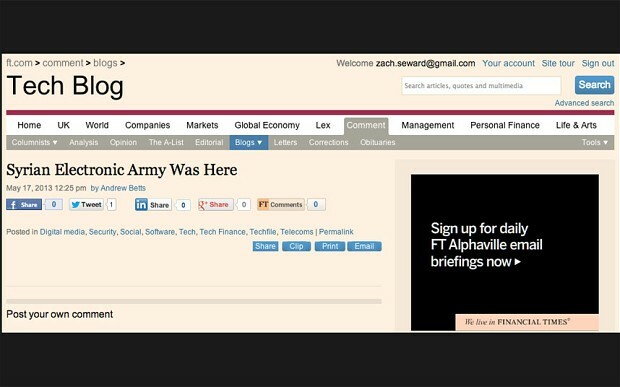 The posh broadsheet's Tech Blog - at http://blogs.FT.com/beyond-brics was compromised to run stories headlined "Syrian Electronic Army Was Here" and "Hacked by the Syrian Electronic Army". Twelve posts appeared on the FT’s tech blog between 12.38pm and 12.42pm on Friday, with official Twitter feeds also disrupted. In a later Twitter statement the FT said, "Various FT blogs and social-media accounts have been compromised by hackers and we are working to resolve the issue as quickly as possible." The Syrian Electronic Army, understood to be a number of hackers and online activists that support the current Syrian president Bashar al-Assad, may have gained control for up to 14 Twitter accounts run by the newspaper. The group of hackers has claimed responsibility for attacks against the BBC, the Associated Press, The Guardian and others in recent weeks, usually targeting official Twitter accounts.